EUR/USD breaks above downtrend channel but must break above the resistance trend line of the larger sideways correction. The EUR/USD is trying to break above the resistance line (dotted orange) of the downtrend channel but price action is making an extended correction and need to break above the immediate resistance (red) as well before a larger bullish swing can start. The EUR/USD could have completed the wave B (blue) and might be ready for a bullish wave C (blue) if price manages to break above resistance (red) with strong bullish candles. The overall picture remains corrective and choppy but at the moment a larger bullish correction towards Fibonacci retracement levels within waves Y (purple/pink) of wave B (light purple) seems the most probable. 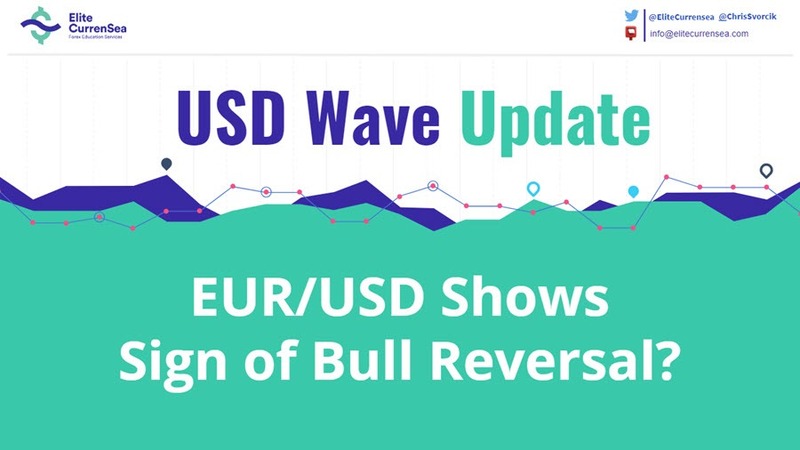 The EUR/USD has either made a bullish ABC or could be building a 123 wavepattern. A bullish breakout favours the 123 pattern whereas a bearish break makes the ABC variation more likely. Elite CurrenSea Training Program(s) should not be treated as a recommendation or a suggestion to buy or sell any security or the suitability of any investment strategy for Student. The purchase, sale, or advice regarding any security, other financial instrument or system can only be performed by a licensed Industry representative; such as, but not limited to a Broker/Dealer, Introducing Broker, FCM and/or Registered Investment Advisor. Neither Elite CurrenSea nor its representatives are licensed to make such advisements. Electronic active trading (trading) may put your capital at risk, hence all trading decisions are made at your own risk. Furthermore, trading may also involve a high volume & frequency of trading activity. Each trade generates a commission and the total daily commission on such a high volume of trading can be considerable. Trading accounts should be considered speculative in nature with the objective being to generate short-term profits. This activity may result in the loss of more than 100% of an investment, which is the sole responsibility of the client. Any trader should realise the operation of a margin account under various market conditions and review his or her investment objectives, financial resources and risk tolerances to determine whether margin trading is appropriate for them. The increased leverage which margin provides may heighten risk substantially, including the risk of loss in excess of 100% of an investment.